Customer centric accounting right inside Act!. work more efficiently and do away with double data entering! 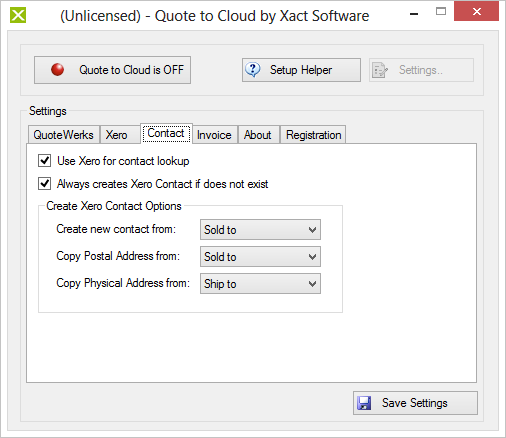 with xact quote to cloud you can do all your work in quoteworks and seamlessly integrates with xero contacts and document. Over 83,000 users in over 100 countries use QuoteWerks as it provides the depth of features they look for and the optional QuoteValet and QuoteValet Web provide for online delivery and quote acceptance including e-signature. Free fully featured 14 days trial! Scroll down for more details. The first to connect QuoteWerks to Xero, a cloud based accounting software, for a complete quote-to-billing workflow. Avoid duplicate data entry by saving Quotewerks contacts to Xero and linking. Automatically creates a Xero contact if it does not already exist and avoids duplicated contact records in Xero. Create a Xero document from a Quotewerks document, live! without need to synchronise. Lookup a Xero contact from within Quotewerks without need to create an address book in Quotewerks. Push any Quotewerks line item to Xero without need for mutual line item numbering for flexible data entry. Write Xero invoice number to Quotewerks document for easy identification. Contact us for additional user packs including 5 and 10 users.